Thailand's anti-government "Red Shirts" paraded the bodies of dead protesters through the tense capital today and said the time for negotiation was over after the worst political unrest in 18 years. The Reds vowed to press on with their bid to overthrow the government of Prime Minister Abhisit Vejjajiva following weekend clashes in Bangkok that left 21 persons dead and more than 800 injured. Hundreds of Sikhs yatris (pilgrims) from across the world have converged at Gurdwara Punja Sahib in Hassanabdal, around 40 km north-west of Islamabad to be part of the Baisakhi festival celebrations that took off on Monday. The next war between India and Pakistan could be fought over water, Lashkar-e-Toiba founder Hafiz Muhammad Saeed has claimed. Saeed, who currently heads the Jamaat-ud-Dawah, made the remarks while addressing a gathering at a mosque in the Chowburji area of Lahore yesterday. Pakistani authorities have imposed a ban on the travel of Indian Sikh pilgrims to places for which they do not possess a visa, as 1,400 devotees arrived here to take part in celebrations marking the Baisakhi festival. The Home Department of Punjab province banned such travel by issuing an official circular, official sources said today. Thailand's anti-government "Red Shirts" paraded the bodies of dead protesters through the tense capital today and said the time for negotiation was over after the worst political unrest in 18 years. The Reds vowed to press on with their bid to overthrow the government of Prime Minister Abhisit Vejjajiva following weekend clashes in Bangkok that left 21 persons dead and more than 800 injured. 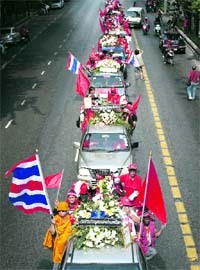 A stream of cars, pick-up trucks and taxis filled with Red Shirts gathered at their main rally site in the historic district of Bangkok before beginning a procession through the capital with their fallen comrades. Thailand has been in turmoil for weeks but the protesters say they will not end their campaign until the government dissolves Parliament and calls fresh elections, despite the deaths of 17 civilians and four soldiers yesterday. "We want people in Bangkok to know what happened to the Red Shirts because the government and the army control the news," said Chakkricth Kadeeluck, a 34-year-old watch seller from Chonburi, east of the capital. "The Red Shirts want the people to know the truth." The demonstrators are calling for Abhisit to step down and leave the country, saying there is no point in further negotiations with the government. "What else is there to talk about?" said Reds leader Jatuporn Prompan. Abhisit offered last month to hold elections by the end of 2010, one year ahead of schedule, to end the standoff with the Reds, but protest leaders rejected the proposal. The government also played down local media reports today that Abhisit might offer to bring forward the polls to October. The three-day wheat harvesting festival also marks the beginning of Sikhs’ New Year and founding of Khalsa Panth in 1699 by tenth Sikh Master Guru Gobind Singh. Followers of Sikhism, who have come from Canada, the United States and Europe besides different parts of Pakistan, including the restive tribal region, will be renewing the pledge to exercise brotherhood and harmony, as enshrined in the teachings of Guru Granth Sahib, a keeper of the shrine told reporters. Baisakhi has its own sights and sounds and the Sikh community celebrates it to lift up their spirits and add colour to life. The Khalsa Panth was meant for protecting sanctity of Sikhism and fighting social evils. According to Sikh religion mythology, the Guru undertook days long meditation and prepared an ‘amrit’ that was provided to those followers who were going to be the part of the revered Khalsa Panth. Drinking the ‘amrit’ was a sort of oath or commitment to wage struggle against atrocities and social evils. Guru Gobind Singh was born in Patna (Indian) and later migrated to Hassanabdal in Pakistan, where he continued preaching Sikhism. Sikhs believe that during his stay at Hassanabdal, Guru Gobind Singh was one day refused water by a local preacher, who also hurled a huge stone on Sikh followers from the top of a hill. The Sikhs believe that when Guru Gobind Singh stopped the stone with his hand, it miraculously turned into a loaf of wax and still bears the imprint of the ‘Punja’ (hand print) of the Guru. They declare the Punja imprint, a symbol of Shanti (peace) and a source of inspiration to motivate them to piety and brotherhood. They touch the handprint of Guru Gobind Singh with a belief that its touching mitigates their miseries and hardships. The continuously oozing water from underneath this stone affix in the premises of Gurdwara Punja Sahib is also described as a miracle of the Sikh Master. During their stay at the Gurdwara, Sikh pilgrims sleep on the floor as a ritual. After the holy Granth that carries the writings of the first nine Sikhs, the Dasam Granth is another major scripture of the community carrying the writings of the last Guru Gobind Singh. Though only the holy Granth is installed at all gurdwaras because it was declared the eternal Guru of the Sikhs by Guru Gobind Singh before his death in 1708, some gurdwaras associated with his birth and death in Patna and Nanded have also installed the Dasam Granth. However, Sikh scholars, including Ragi, are against its installation as they suspect the authenticity of the Dasam Granth because of objectionable parts - references to women in derogatory languages, sexual promiscuity and intoxicants - in it. They say the last Sikh guru could never have written these parts, linking the derogatory parts to conspiracy theories against the community. But opponents say these scholars are denigrating the Dasam Granth and should be excommunicated from the Sikh religion. Toronto-based former Akal Takht head priest Ragi was ex-communicated from the Sikh clergy last December for voicing his opposition to the scripture. Last week Ragi, who presided over the Akal Takht at the height of militancy in Punjab in the 1980s, was not allowed to perform kirtan at a suburban gurdwara with his opponents taking out their kirpans and injuring one of his prominent supporters. The protesters were opposed to the ostracised former Akal Takht head priest being invited to the gurdwara. Sikhs are not supposed to do anything with someone excommunicated by the Akal Takht - their spiritual and temporal seat in Amritsar. He claimed India was diverting the flow of rivers in Jammu and Kashmir by building dams and tunnels in a bid to turn Pakistan into a desert and to "spoil the regional situation". Saeed, who remained out of the public eye for over a year following the 2008 Mumbai attacks carried out by the LeT, called on the people of Pakistan to stand united against India and to oppose the construction of dams that allegedly rob the country of its share of river waters. The next war between India and Pakistan could be fought over water if India did not stop its "water terrorism", Saeed said. Pakistan has often accused India of diverting its share of waters from rivers in Jammu and Kashmir though New Delhi has denied the charges. Saeed further claimed that India and the US were facing "defeat" in Jammu and Kashmir and Afghanistan. The US was searching for a "safe exit" from Afghanistan and India was worried about what would happen to it after the US withdrawal from the region, he said. Over the past two months, the JuD and other militant groups like the Hizb-ul-Mujahideen have organised several gatherings and rallies in which they have backed calls for 'jehad' against India and expressed support for militant groups operating in Jammu and Kashmir. Saeed has openly called for 'jehad' against India, saying the Pakistan government should prepare the people to counter the "war" imposed by India. The JuD chief was placed under house arrest in Lahore in December 2008 after his group was declared a front for the LeT by the UN Security Council in the wake of the Mumbai terror attacks. He was freed after about six months on the orders of the Lahore High Court. The circular was sent to the Evacuee Trust Property Board (ETPB), which looks after shrines of minority communities and organises pilgrimages to such sites, and to law enforcement agencies. The circular stated it was the duty of authorities “to provide all facilities and protection to the Sikh yatris (pilgrims). But it is important for their (Sikhs’) protection to disallow them to visit places for which they are not issued visa by the Pakistan High Commission in India.” Law enforcement agencies and the ETPB were asked by the Home Department to enforce the ban at any cost. The circular said Pakistanis found taking the pilgrims to cities for which they had not been issued visas would be strictly dealt with. Jackson slept with eyes open?